Alligator wrestling is an attraction, that later evolved into a sport, that began as a hunting expedition for Native Americans. It has been described as "alligator capturing techniques". 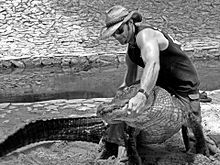 Southeastern Native Americans hunted alligators as a food source for thousands of years. At the turn of the 20th century, showing off alligators as roadside attractions helped Native Americans generate revenue. Long before the first Europeans explorers wandered into the Florida Everglades, alligator wrestling existed. For tribes like the Seminole and Miccosukee, learning how to "handle" the reptiles was part of their existence. We had to live off whatever Mother Nature provided us in the Everglades ... We'd eat the tail, the meaty part. Later on, when the alligator skin had a value, we would hunt and skin the gators and bring the skin to trading posts and trade for things we couldn't grow. —  Max Osceola, a Seminole tribal councilman. A common symbol of Florida in popular culture is the American alligator (Alligator mississippiensis). Alligators, also known colloquially as "gators," are part of Florida's popular culture ranging from tourist attractions and alligator wrestlers to postcards and team mascots such as that of the University of Florida. The St. Augustine Alligator Farm was one of Florida's earliest themed tourist attractions that opened for business in 1893. At the St. Augustine Alligator Farm and other tourist attractions such as Gatorland and the Silver Springs Nature Park, "taming" or hypnotizing alligators was a popular trick, along with other performances such as alligator wrestling. ^ a b "Gator Wrestlers Endangered". 2012 BanderasNews ® all rights reserved. Retrieved June 11, 2012. ^ "African American Man Wrestling an Alligator at the St. Augustine Alligator Farm." 17 October 2011. World Digital Library. Web 29 May 2013.